Men who often shave their body hair can now choose from dozens of high-quality electric shavers on the Internet. In fact, there are so many shavers on the market that it can be a bit overwhelming for newbies to pick just the right razor for their needs and budget. If you're interested in finding the absolute best body shaver, please continue to read this article. You should be able to find the best body shaver for your lifestyle from the list of seven products below. The EVOLVE Body Razor is definitely the best body shaver for people looking for a budget play. 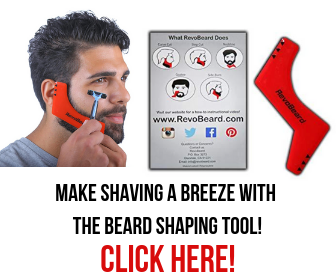 You can use this EVOLVE razor to shave off the hair on your back, legs, and even on your face. Just place your triple-blade cartridge on top of this razor and either fold it out to 16 inches or fold it in half for 8 and ¾ inches of reach. One of the best electric body shavers, the EVOLVE Body Razor has a handle long enough to reach all sensitive areas of your body even the groin area, yet small enough to fit into your toiletry bag when folded. Since this razor folds in half, it’s very convenient for frequent travelers. All EVOLVE Body Razors are made in the USA and are shipped with four triple-blade cartridges. Although the blades have soothing aloe lubrication strips, manufacturers recommend using shaving cream for trimming facial hair. Out of over 100 customer reviews online, the EVOLVE Body Razor has a solid four-star rating. You can pick up this product for $20 on most online retailers. You're going to see a great deal of the Netherlands-based multinational company Philips products in this list. For some reason, Philips is one of the leaders when it comes to producing high-quality body shavers. The company's best body shaver for the price is definitely the Series 1100 model of the Norelco Bodygroom line. It has two rows of metal comb-like cutting teeth placed in the head which are enclosed by a blue strip. 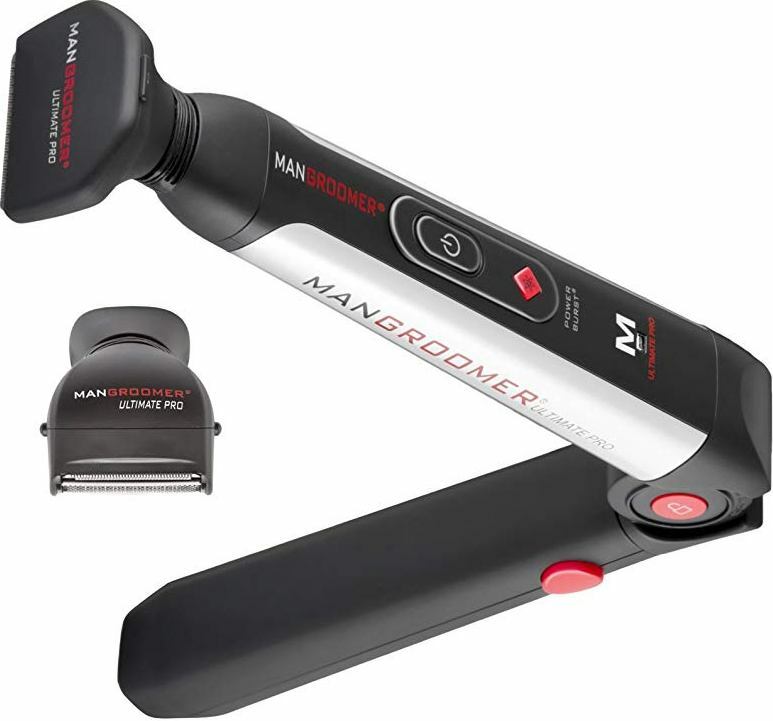 Includes a bi-directional trimmer to cut hair in either direction seamlessly. On both ends, there is a row of black grooves to control the hairs to the cutting blades. These slots are part of the combined skin protector guards that will protect your skin during a close shave. Sensitive skin will have protection from skin irritations. One of the best electric shavers for body hair, Series 1100 is the perfect trimmer for sensitive skin. With the option to use the trimmer in both directions means that you will more effectively be able to trim unwanted hairs that are growing in either direction and other sensitive areas. Just like the EVOLVE razor, the Philips Series 1100 costs up to $20. The razors in this electric shaver cut body hair in two directions to help prevent the irritation of sensitive skin. You can use this waterproof razor in the shower. However, manufacturers say it works best on dry skin. The Series 1100 isn't rechargeable, so you'll have to replace the two AA batteries every once in a while. In addition to the shaver, you'll also get a 1/8-inch comb and a shower cord with your purchase. Although Philips might have more body shavers on the market, Gillette also has a few highly awarded body shaving products. The best body shaver from Gillette has to be the Fusion ProGlide Men's Razor Styler 3-in-1. This package includes a trimmer, one ProGlide power cartridge, a battery, three combs, and one organizer. Tried and tested by dermatologists, the Gillette Fusion ProGlide Styler is body-approved. It works perfectly, even on the sensitive parts of the body. It provides for an effortless shave and trims. You will discover that it gives a comfortable, close shave, yet it cuts hairs right down to the skin. The ProGlide Styler is perfect for body grooming. You can use it for both dry shaving and wet shaving. Shaving with running tap water, or even take it into the shower. You can also use it for shaving head and any part of the body with shaving gels, lotions, foams, or creams. Gillette teamed up with Braun to power this incredibly precise trimmer. You can also use the precision edging blade to help you get the exact look you want without much of a hassle. Believe it or not, this product is so convenient and precise that some women have used it to shave their bikini area as well. Out of an incredible number of 3,600 online reviews, this product still has a four-star rating on Amazon. You can purchase this product online for around $24. 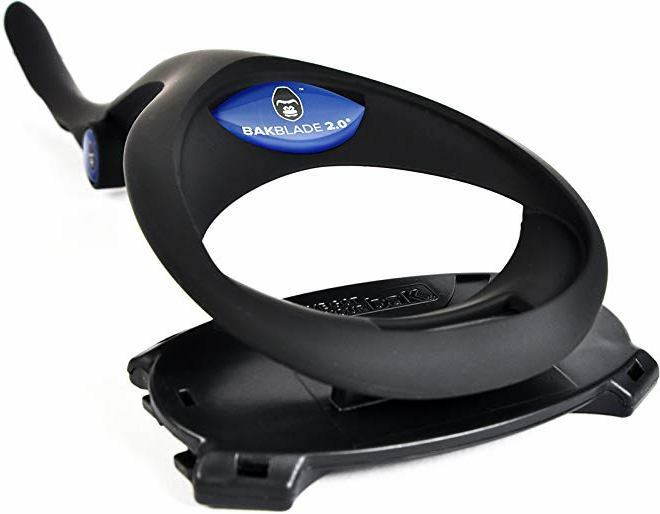 One popular body shaver online is called the BaKblade 2.0 Back Hair Removal and Body Shaver. Manufacturers of this product boast that their patented DryGlide 4'' safety blades offer the safest and closest shave on the market. One of the best features is the option to remove the blade cartridge from the shaving head and using it to shave chest, neckline, or any other difficult areas. It works excellent for detailing these areas, providing a more refined touch without the risk of cutting yourself. It can shave neckline finely after shaving the back. Shaving your neck with any back shaver is hard, and we usually go for a beard razor for this process, but you will be glad that you didn’t, as you will find a smoother and more effective method. You can utilize the BaKblade for both dry and wet shaving. They also say that this particular body shaver's s-shaped handle really helps people with back shaving. Out of almost 50 reviews, this product has an almost perfect rating and is an official Amazon #1 Best Seller. This product costs $30. 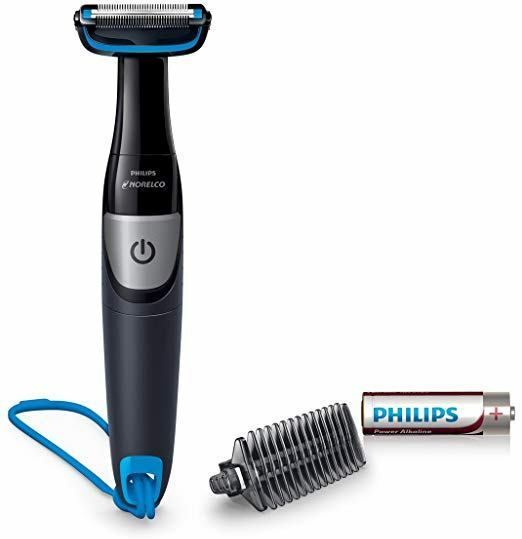 Here's another great Philips body shaver product for you to consider: the Philips Norelco Bodygroom Series 3100. So, what makes this shaver different from the 1100? First off, the 3100 is rechargeable. After eight hours of charge time, you will be able to use this shaver for 50 minutes. A battery indicator is right on the top of this mid-range shaver. The 3100 has three combs and three trimming lengths as opposed to the 1100's one comb. Also, the 3100 can shave from smooth to 7mm, which is different from the 1100's range of only 0.5 to 3mm. You'll get a reach back attachment to help you shave harder to reach places with your Philips Norelco 3100. The 3100 costs $30 on most online stores. Another product many customers consider the best body shaver is the Ultimate Pro Back Shaver by MANGROOMER. This wireless and re-chargeable shaver can open at 135-degrees. It includes a lock button you can use to secure your shaver just where you want it. The two shaving heads on this product have shock absorbing flexible necks to gently shave back hair. You'll also get a 1.8-inch groomer blade ideal for leg shaving. The convenient battery indicator on the device will let you know when you have to re-charge the battery. Out of the approximately 1,800 reviews of this shaver online, the MANGROOMER has an almost 5-star rating. One Ultimate Pro Back Shaver costs $48. 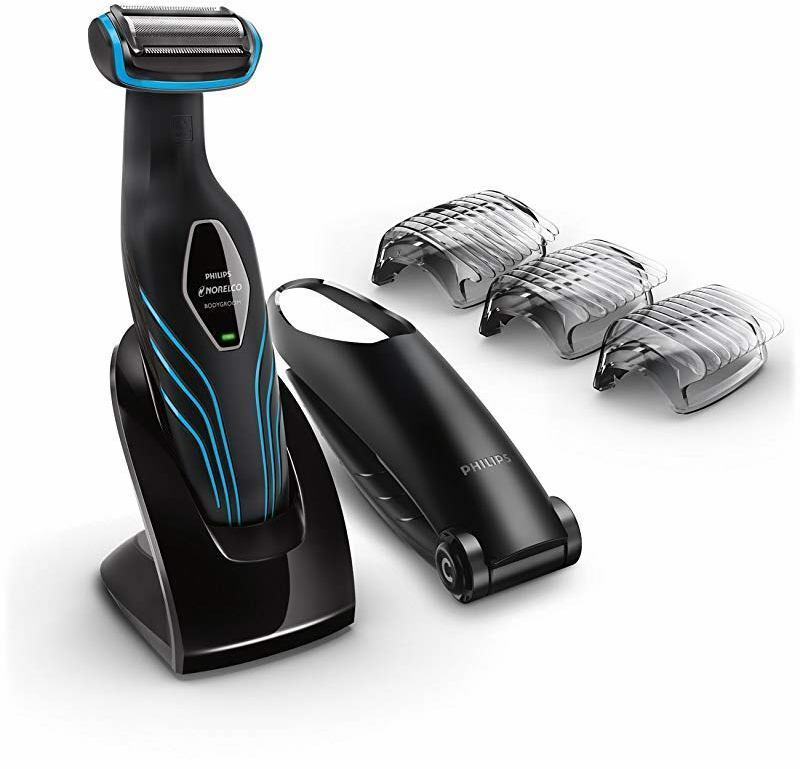 We'll close out this list taking a look at what some consider the best body shaver on the planet: the Philips Norelco Bodygroom Series 7100. Well, this certainly should be the best body shaver considering the product's high price tag. You'll have to pay a hefty $60 to try this shaver out on your body. Probably the best feature of the Philips 7100 is that it only takes one hour to fully charge for a 50-minute use. Instead of getting three combs like with the 3100, the 7100 comes with one adjustable comb that's able to handle five different lengths. The 7100 can trim your hair from smooth to 11mm with its 3D pivoting head. Out of an incredible number of 3,800 reviews, the 7100 maintains its 4-star status. Hopefully, this list has helped you discover the best body shaver for your body and your budget. The razors on this list range from more affordable to slightly expensive. Nonetheless, all of them are high-quality products with many positive reviews. You can easily buy any of the electric razors listed above online.